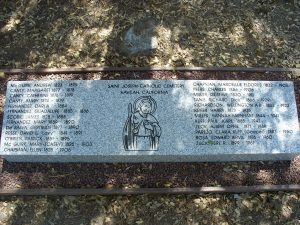 THIS IS THE SITE OF THE FIRST CATHOLIC CHURCH, ST. JOSEPH’S, AND CEMETERY BUILT IN KERN COUNTY IN AUGUST 1866. IT WAS ESTABLISHED BY FATHER FRANCIS DADE, THE CIRCUIT PRIEST HEADQUARTERED IN VISALIA. THE CATHOLIC CHURCH HERE IN HAVILAH WAS MOVED TO BAKERSFIELD IN 1873 WHEN THE GOLD RAN OUT. ST FRANCIS CHURCH WAS THEN BUILT IN BAKERSFIELD IN 1881 AND IS STILL A PRINCIPLE PARISH TO THIS DAY. GOLD DEPOSITS AT HAVILAH WERE DISCOVERED IN 1864. 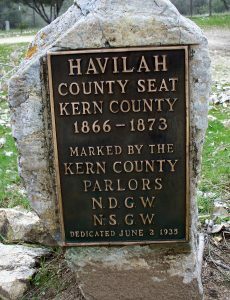 AFTER KERN COUNTY WAS ORGANIZED IN 1866, HAVILAH WAS THE COUNTY SEAT UNTIL 1872, WHEN THE GOVERNMENT WAS MOVED TO BAKERSFIELD. 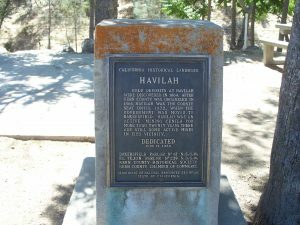 HAVILAH WAS AN ACTIVE MINING CENTER FOR MORE THAN TWENTY YEARS. THERE ARE STILL SOME ACTIVE MINES IN THIS VICINITY. BAKERSFIELD PARLOR No. 42 N.S.G.W. EL TEJON PARLOR No 239 N.D.G.W. 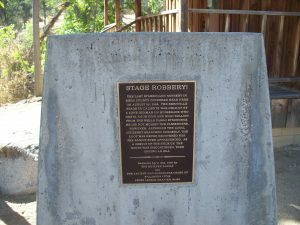 The plaque reads: STAGE ROBBERY ! THE LAST STAGECOACH ROBBERY IN KERN COUNTY OCCURRED NEAR HERE ON AUGUST 28, 1896. 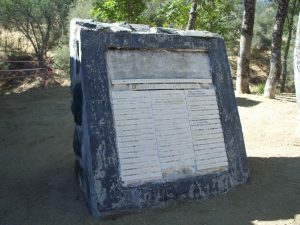 THE KERNVILLE STAGE TO CALIENTE WAS HELD UP BY A LONE GUNMAN ON HORSEBACK WHO GOT $1,700 IN COIN AND GOLD BULLION FROM THE WELLS-FARGO STRONGBOX. HE DID NOT MOLEST THE PASSENGERS, HOWEVER, ALTHOUGH THE LOCAL CITIZENRY SEARCHED DOGGEDLY, THE LOOT WAS NEVER RECOVERED NOR THE BANDIT EVER APPREHENDED. AS A RESULT OF THE STICK-UP, THE ROUTE WAS DISCONTINUED. THUS ENDING AN ERA. 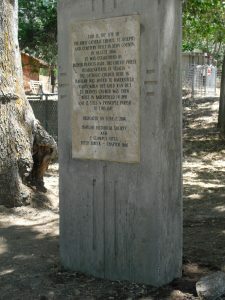 (This is the old one , see the replacement plaque  below) In 1966 a monument was erected to mark the 100th Anniversary of the founding of Kern County, also to recognize Cleone and Frank Shaw for donating the land to the Havilah Centennial Group to erect a replica 1866 Court House/Museum, and a replica 1867 School House/Museum — and all those involved in the construction / re-construction or donating to the construction. In commemoration of the 150th Anniversary, the Kern County Board of Supervisors held a regular Board meeting in a large tent behind the School House on April 19, 2016. As a result of that meeting, Supervisor Mick Gleason offered for the Board to pay for refurbishing or replacing this sadly deteriorated memorial. THANK YOU MICK GLEASON AND CURRENT SUPERVISORS ON THE Kern County Board of Supervisors! It would have cost almost 3 times what a new plaque would cost, so the Supervisors paid to have a new one made. 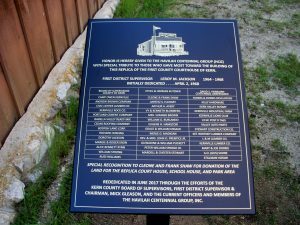 This is the new plaque that replaces the old 1966 Plaster of Paris monument that was placed just outside of the 1866 Court House Bldg in commemoration of the 100th Anniversary of the founding of Kern County in 1966. The new one was re-dedicated Monday June 5, 2017. THANK YOU AGAIN, TO THE CURRENT KERN COUNTY BOARD OF SUPERVISORS, AND ESPECIALLY TO SUPERVISOR MICK GLEASON! 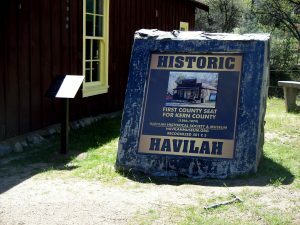 The Supervisors came up to Havilah on April 19, 2016 to celebrate the 150th Anniversary of the founding of Kern County, and Supervisor Gleason suggested we either repair or replace the old one. We replaced it, and the Supervisors supplied the funding! Here is the newest plaque we just installed at the front of the Court House on April 17, 2018 using the old 1966 monument base. Quite an eye-catcher as you drive by, and hopefully it will cause more visitors to stop and enjoy our history!